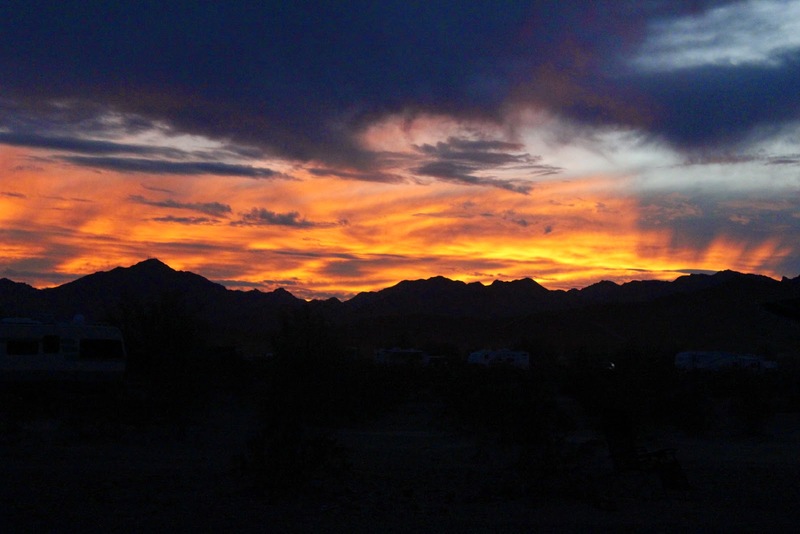 One of the enjoyable moments at Quartzsite is waiting for the sun to set and then being awed by the sunsets. An appropriate phrase that is used is "waiting for the color to blossom". The color starts light, then deepens, and just as quickly can disappear. Roger was always so good about starting the fire before the actual sunset. Then it would be roaring as people would stand around or sit to watch the display. You almost want to applaud! 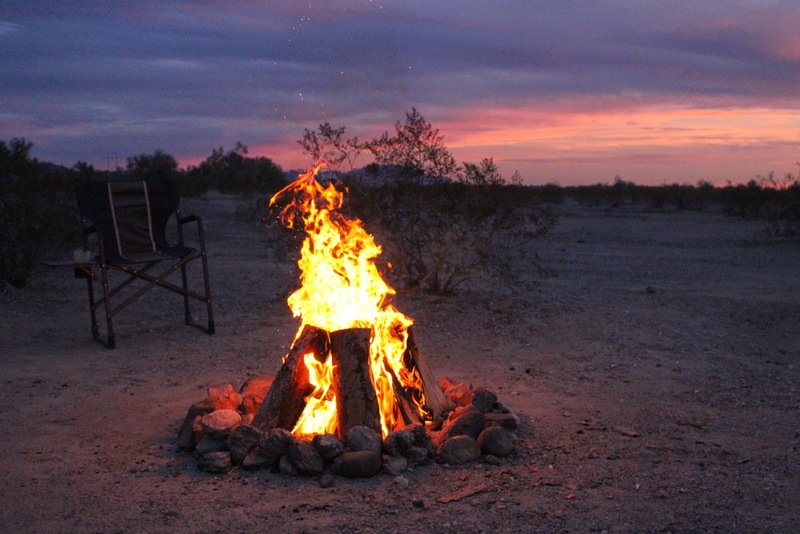 Thanks to Roger for another wonderful stay at Quartzsite. It goes by so quickly, but we had some wonderful "happy hours", and conversations( often concerning our Lazy Daze homes.). 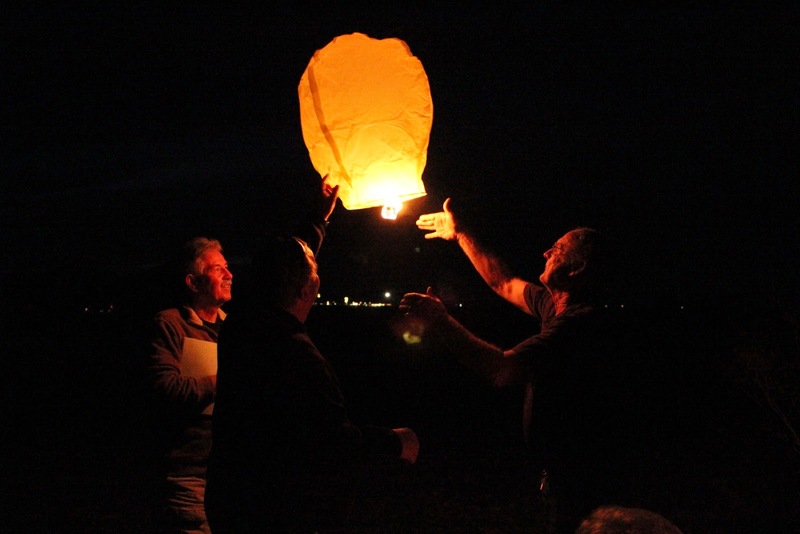 Roger made sure there was plenty of wood(everyone gladly contributed to the cause) and also had a great collection of Chinese Lanterns to set off into the night sky. The group numbered up to 24 Lazy Daze coaches this year. Jan and I have deliberated a bit over our itinerary, as loose as it is, heading north and then east for August. The question is planning our timing to enjoy some warm weather before heading into Nevada, Eastern California, Eastern Oregon, Idaho, and then possibly a mix of Mid Western states. 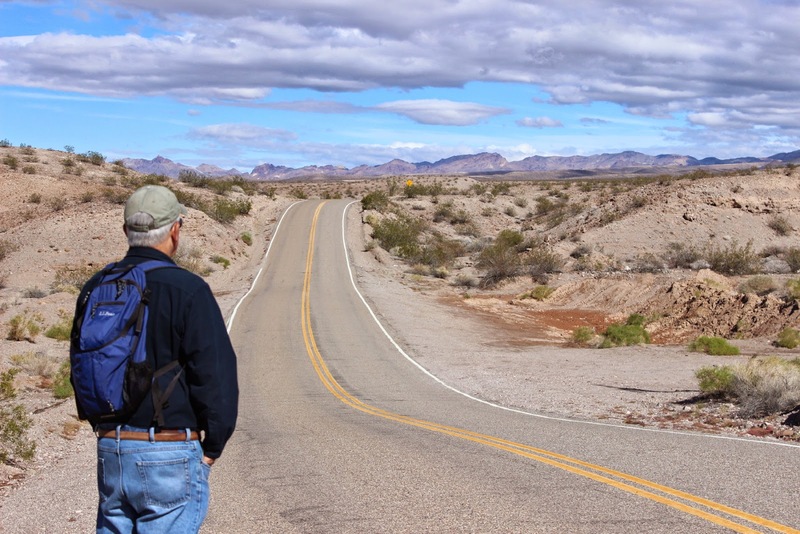 So, off we head, north to Parker , Lake Havasu City, Bullhead City, and then south to Organ Pipe National Monument on the Mexican border. From there, we plan to head east to Tucson, north to some pretty country east of Phoenix, and then west into Death Valley, California. 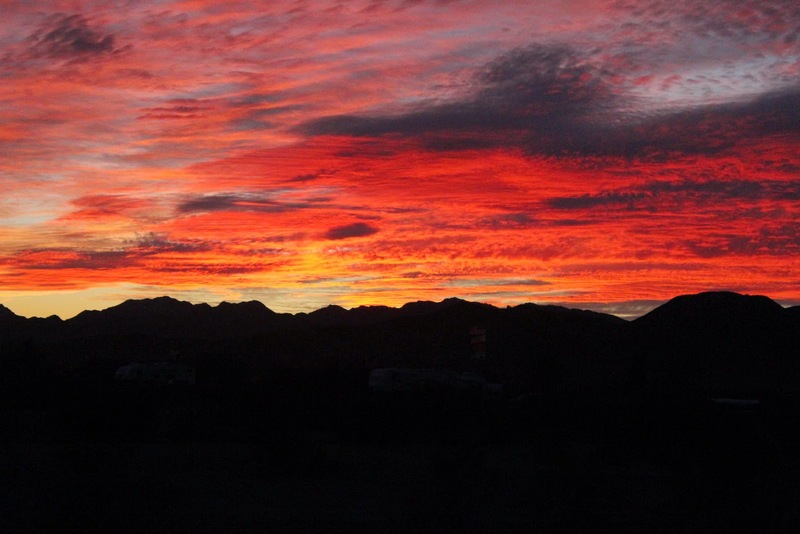 The picture above and to the right is from Buckskin Mountain State Park in Parker, Arizona. Once we arrive in Parker, Route 95 follows the Colorado River. 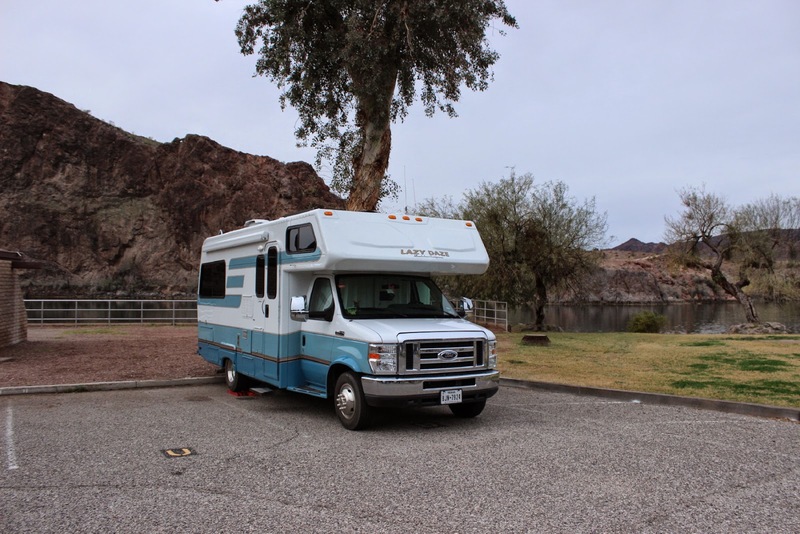 Our site looks across the Colorado to the California side and another private campground. There are many campgrounds on both sides in this stretch of the river. 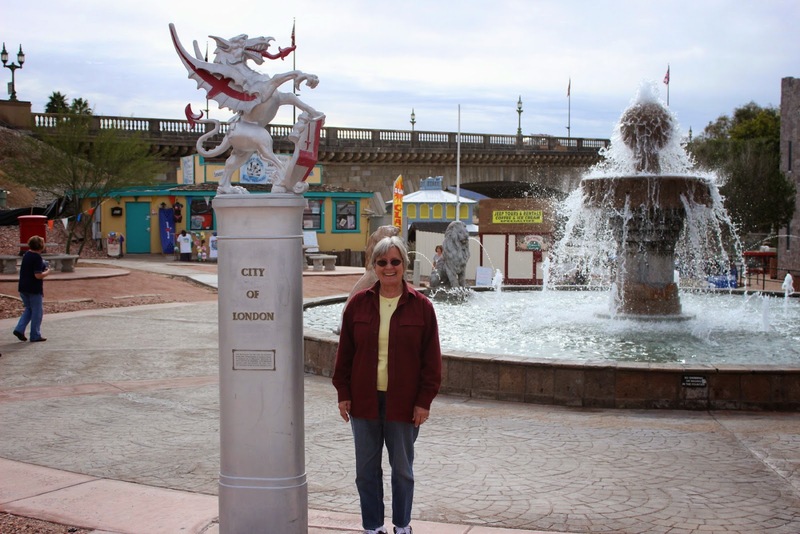 The next stop going north is at Lake Havasu City. This is a city that was built on 26 acres of land purchased in 1963. While it is now well known as a Spring Break destination for college students, it is also a center for Snow Birds and tourists. One special must see is always--the London Bridge. The most famous bridge in the world. 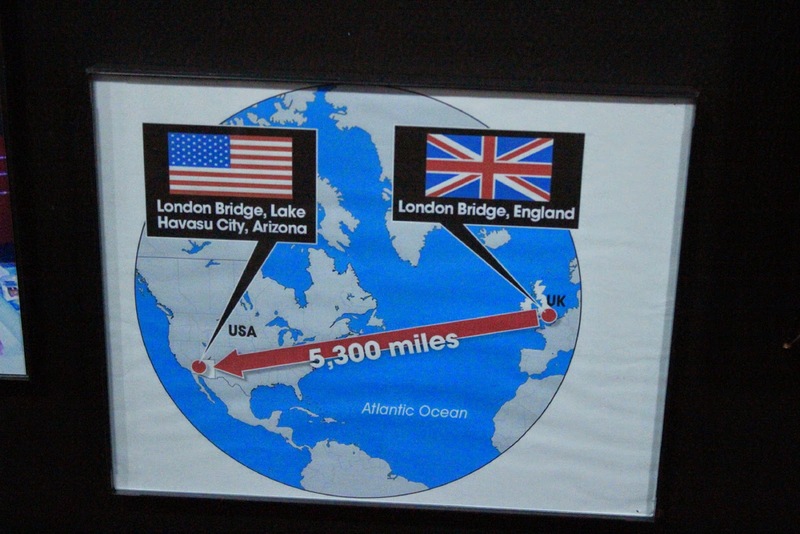 And, yes, it was falling down in 1968 in London, and they needed to replace it with a modern bridge for London traffic. 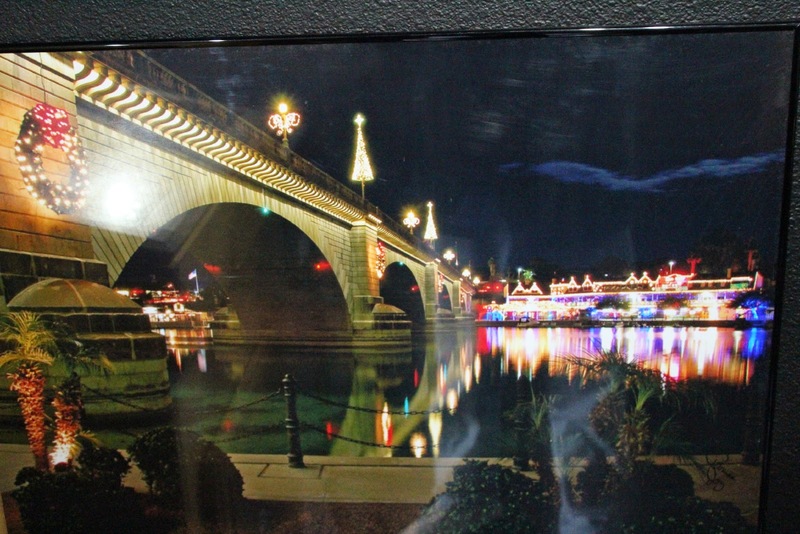 Lake Havasu founder Robert P. McCulloch purchased the bridge for $2,460,000 and proceeded to plan the dismantling, numbering of pieces, and the reconstruction, The bridge was dedicated in 1971. Jan and I cannot fathom why the Londoners would have agreed to part with such a famous landmark. Bruce brought Jan to the city of London for a special trip. 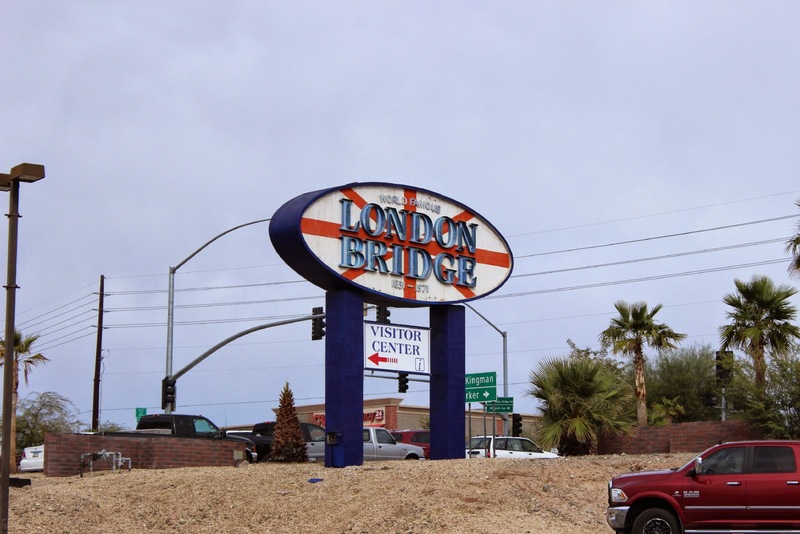 Oh, that is, the London circle at the London Bridge in Lake Havasu City in Arizona. The picture to the left is from their museum. It shows a well lighted bridge at night. 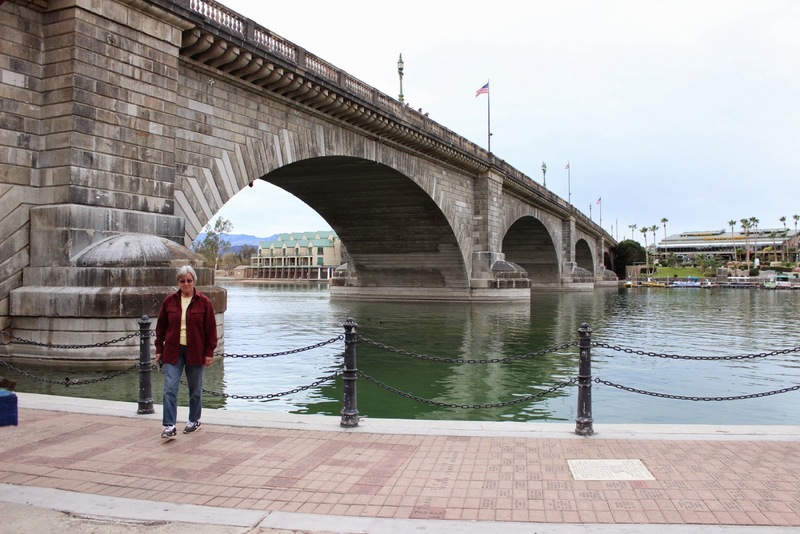 The bridge is not directly on the Colorado River, but was built on a canal offshoot. 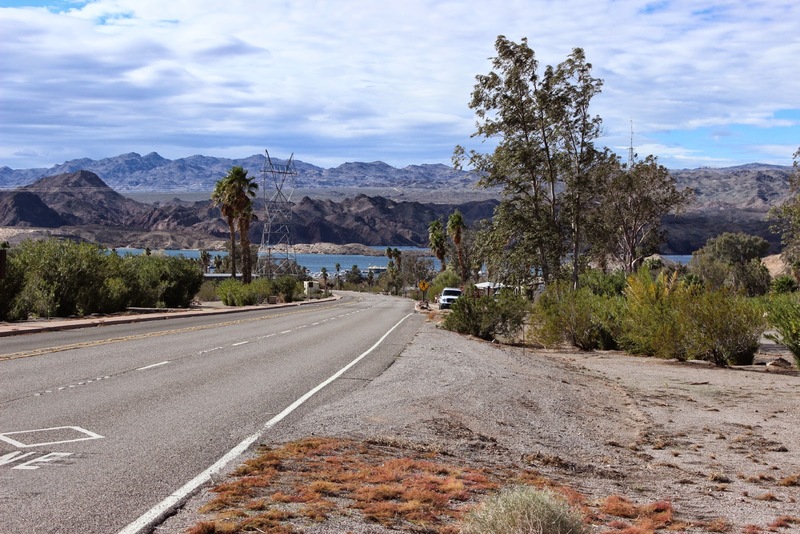 From Lake Havasu, we still follow Route 95 to 40, to 95, to 68 to Katherine Landing. 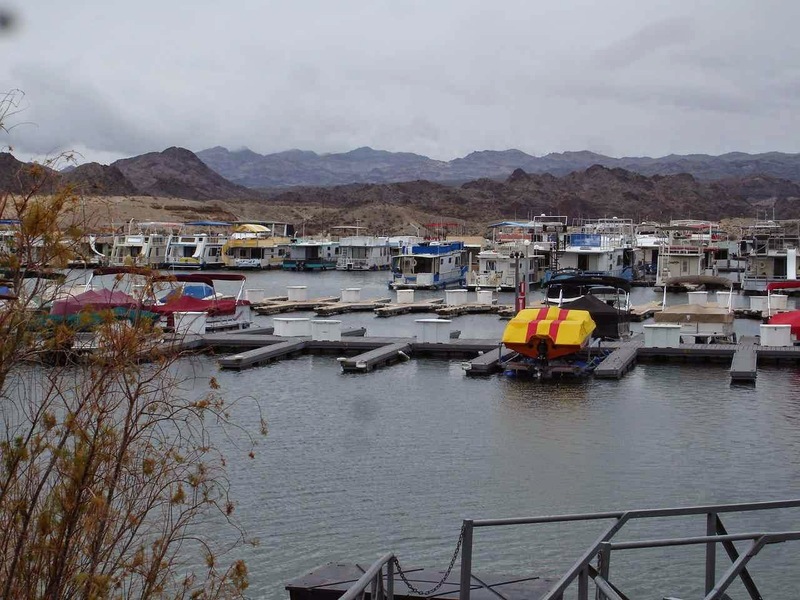 This is a National Recreation Area, part of the Lake Mead Recreation Area. 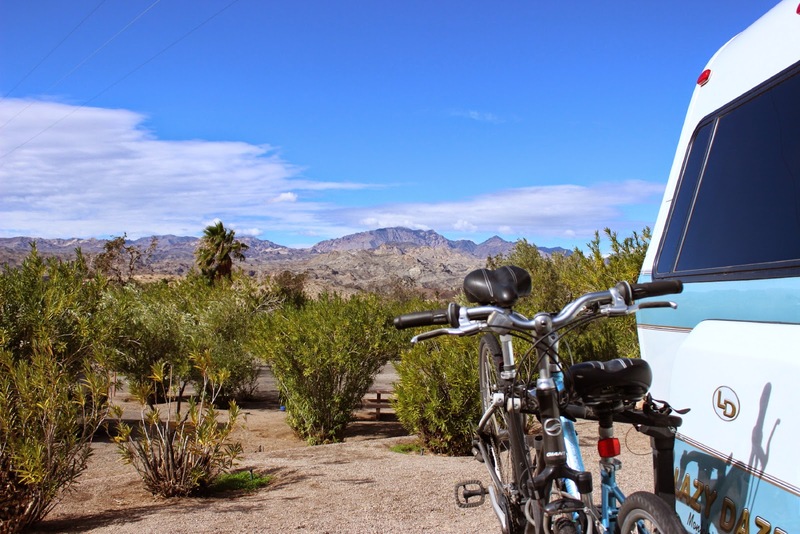 Our stay at Quartzsite was $40 for two weeks of boondocking--giving us access to a dump station and fresh water. 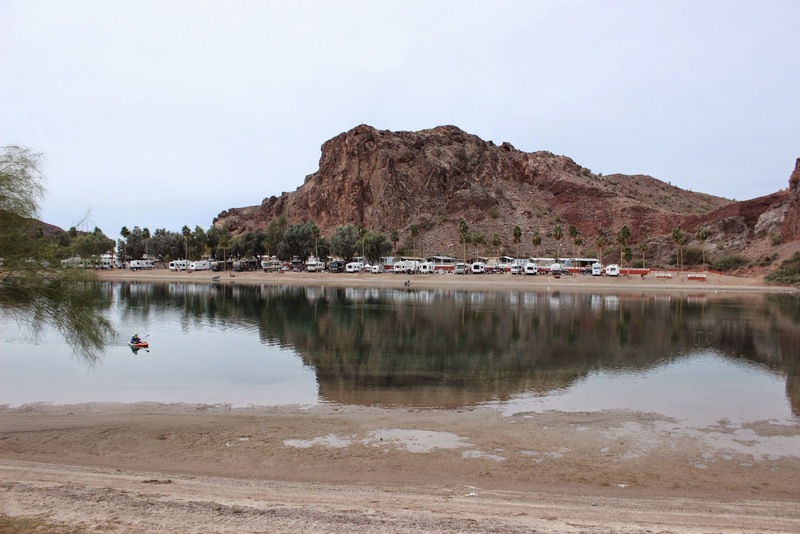 This campground is an organized campground with nicely separated and private sites. Dry camping--no hookups-- but a dump station in the park and fresh water. 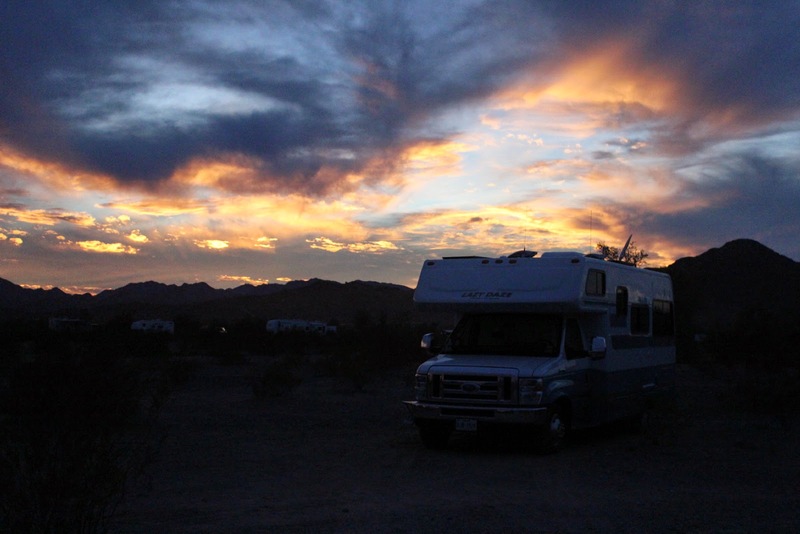 With our senior pass, this campground costs $5 per night and our view above is wonderful. The view from just outside our campground road. This road leads to the marina and the boat launch in the National Area. The river here is above the Davis Dam and the body of water in this section is called Lake Mohave. The Colorado River stretches 67 miles north from here to the Hoover Dam. Boaters can navigate almost all of that mileage. 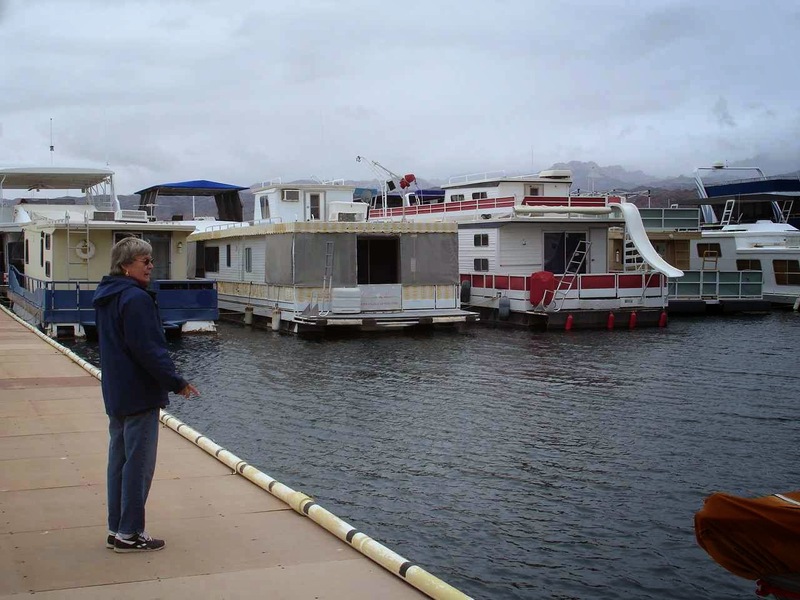 Thus, the reason for some of these huge houseboats. According to the locals, some people will spend weeks aboard their boats. They have 12.7 kilowatt generators, lounges, water slides, satellite tv, 4 or more king sized beds, and more. This was a cooler weekend. Actually, we were rather surprised to have two full rain days within a week or so in Arizona. Just the same , Saturday and Sunday were in the 60's. This water is crystal clear with lots of fish. Would you believe, we only saw one or two boats being used the entire time we were here. 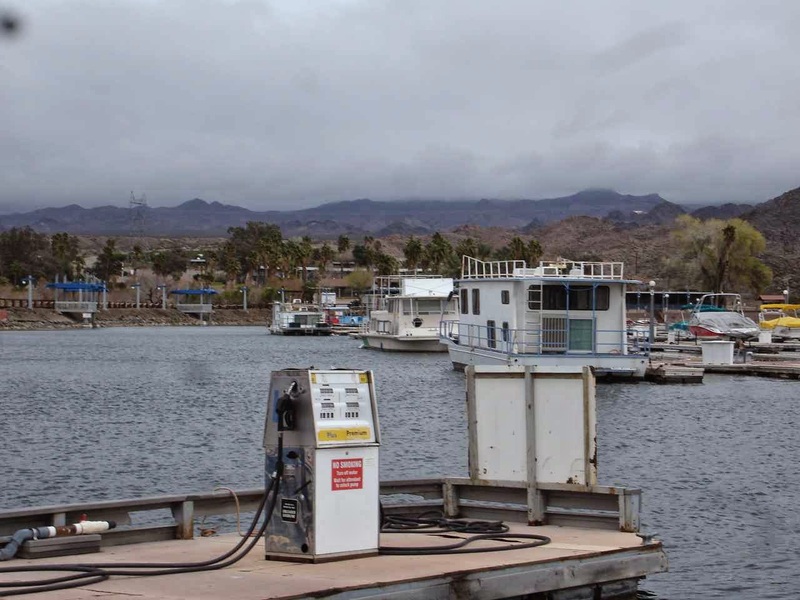 The same locals as before, indicated that on July 4th weekend, the marina and area are so crowded that all the parking lots are filled and a line of waiting people stretches about a mile back to the highway. Oh , and yes, the temperature would be about 112 to 118 degrees. A short hike over to Telephone Cove from our campsite lets us enjoy the surrounding views. No traffic on this road now. Probably extremely busy in the summer. This is actually a huge parking lot for boats and trailers. The water right in front is Telephone Cove, big enough to be a lake by itself. Beyond towards the hills in the distance is the Colorado River. You really got some nice sunset shots in Q. Looks like your route is taking you to all the highlights of the area. Enjoy!